Kenneth Eric Church is an American country music singer and songwriter. Signed to Capitol Records in 2006, Church released his debut album Sinners Like Me that year. This album produced four chart singles on the Billboard country charts, including the Top 20 hits "How 'Bout You," "Two Pink Lines" and "Guys Like Me." His second album, 2009's Carolina, has produced two more singles: "Love Your Love the Most" and "Hell on the Heart" which have become his first two Top 10 hits. 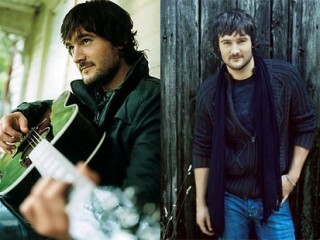 Eric Church grew up in Granite Falls, NC, and began singing as a child. At 13, he started writing songs, later teaching himself to play guitar. While attending college at Appalachian State, he formed a band, the Mountain Boys, that played around western North Carolina. After graduating with a degree in marketing, he moved to Nashville, TN, to pursue a career in country music. It took him a year to get a song publishing deal with Sony/ATV Tree, after which he started getting his songs recorded by other artists, an example being Terri Clark's version of "The World Needs a Drink." He met producer Jay Joyce, who took an interest in him as a recording artist, and they began making demos. That led to his being signed by Capitol Records Nashville. His debut single, "How 'Bout You," was released in early 2006, and it had reached the country Top 20 by the time Capitol released his first album, Sinners Like Me, on July 18, 2006. The album was both a critical and commercial success, and Church followed it up with Carolina in 2009. 2006	"How 'Bout You" ; "Two Pink Lines"
2007	"Guys Like Me" ; "Sinners Like Me"
2008	"His Kind of Money (My Kind of Love)"
2009	"Love Your Love the Most" ; "Hell on the Heart"
2010	"Smoke a Little Smoke"
View the full website biography of Eric Church.